These keto chocolate chip cookies are truly the real deal. Created by a former pro pastry chef who refuses to eat mediocre low carb cookies. These keto chocolate chip cookies are the real deal. They are not just OK, and this is not simply a passable recipe that will get you through a chocolate craving. Working as a brand new young pastry cook in an iconic restaurant years ago was incredibly stressful and fast-paced. But every now and then, there was a magical day where everyone was ahead in their work and the whole kitchen buzzed with positivity. On those days, one of two things would happen. Either our small pastry department would walk together to the coffee shop down the street for a fancy coffee (sort of a hilarious treat, considering we could have made espresso right upstairs in the service kitchen), or one of us would whip up a large batch of chocolate chip cookies to share with the restaurant staff. Those chocolate chip cookies were the best, and they were never, ever on the menu. Just a delicious, secret snack shared among true food lovers. We always used Bo Friberg’s recipe from The Professional Pastry Chef (the pastry Bible, as far as I’m concerned). That chocolate chip cookie recipe sets a very high bar, and I’ve never found one that tops it. After I was diagnosed as a Type 1 Diabetic, I started baking low carb treats with almond and coconut flour using recipes I found on the internet. Most will tell you not to waste expensive low carb ingredients trying to re-work a high carb recipe. Just use the recipes that are already out there, they say. And wow, low carb ingredients are SO, SO different from regular all purpose flour and sugar. You will often see recommendations to substitute almond flour 1:1. Or to use ¼ cup of coconut flour for every cup of all purpose flour in a recipe (usually followed by a lot of disclaimers about needing more eggs as well). The truth is that these suggestions rarely, if ever, translate well. So I stuck with the recipes I could find, for a while. After all, the Type 1 diagnosis had stolen some of my baking mojo. But guys, I’m not ok with baking a weirdly textured, bland cookie and pretending it’s delicious, just because it fits my low carb diet. I want a chocolate chip cookie that reminds me of those magical cookies I used to love. I want a heavenly cookie that you, dear readers, will LOVE. 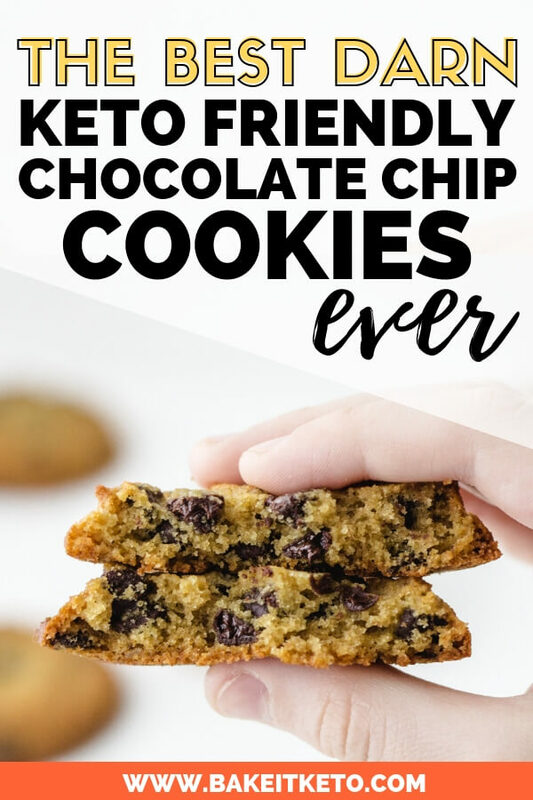 Not just because they are a little something sweet that helps you stick to your keto diet, but because they are truly SO. DARN. GOOD. 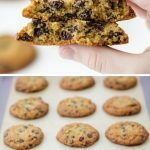 Why Make Keto Chocolate Chip Cookies With Coconut Flour? If you’re a regular reader of the blog, you’ll know that my body simply doesn’t tolerate almonds well. A while back I (very skeptically) took a food sensitivity test which showed I had a high reactivity to almonds. Nothing else, just almonds. At the time, I was baking treats with almond flour and using Nutpods (delicious, by the way) in my coffee. Yup, cue the sad trombone. Feeling pretty confident that the test was wrong (after all, I didn’t have any digestive issues with almonds), I decided to cut almonds out of my diet for a trial period. I assumed I wouldn’t see any changes, I would prove the test was exaggerating, and I would go back to my merry almond-eating ways. But then… at the end of 30 days, I realized the autoimmune skin condition near my elbow that had been gradually spreading for two years had completely disappeared. Gone. Coincidence? Maybe. But right now, baking with coconut flour is what works for me, so that’s what I’m doing. Some people don’t tolerate coconut flour well and do better with almond flour instead. You do you. 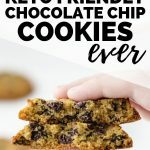 But whether you’re a fellow almond avoider, or you’re just a low carber looking for some AMAZING keto chocolate chip cookie dough, this recipe’s for you. Can you eat coconut flour on keto? Short answer: Yes. Coconut flour is extremely absorbent, and most recipes require a whole lot less of it than regular all purpose flour. How many carbs are in coconut flour? The half cup of coconut flour in this recipe adds 1.78g total carbs per serving (including the 1.11g of fiber). Not too shabby. Is coconut flour good for cookies? 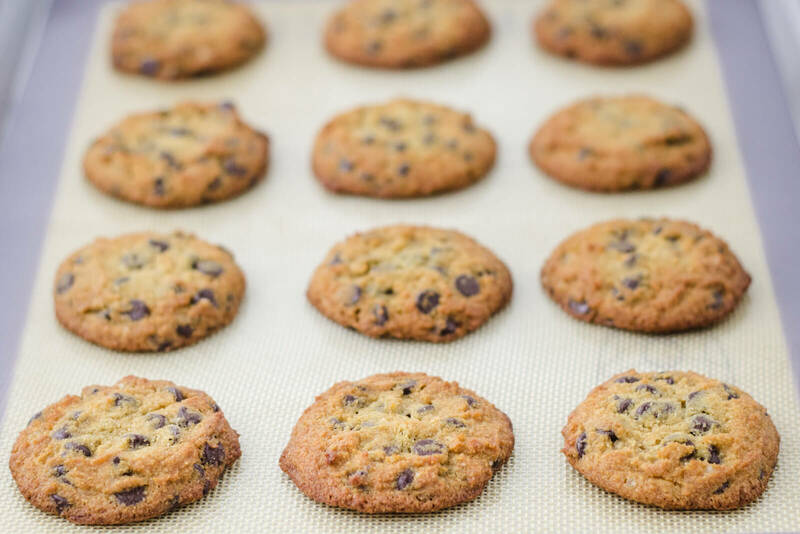 With the right proportions and the right supporting ingredients, coconut flour is great for cookies! You can’t just substitute coconut flour for all-purpose flour, however. Not only does coconut flour absorb a lot more liquid, but it also lacks the gluten needed to create structure in baked goods. If you’ve ever tried to bake a recipe with coconut flour and the final product completely fell apart after it was cool, this is why. Is Dark Chocolate OK For A Keto Diet? Despite the small number of carbs and grams of sugar in one small square of dark chocolate, as a Type 1, I find that it spikes my blood sugar much more than the nutrition label would have us believe. So whenever possible, I use dark chocolate that’s sweetened with stevia, erythritol, inulin, or allulose. 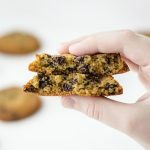 For this recipe, I recommend Lily’s Dark Chocolate Chips, which are sweetened with a combination of erythritol, inulin, and stevia. If you’ve been eating keto for awhile and your taste buds are easily overwhelmed by sweetness, another alternative is to use unsweetened chocolate. Pascha makes organic, unsweetened chocolate chips (you could also just chop up a bar of unsweetened baking chocolate!). Can You Substitute Stevia For Erythritol And Allulose In This Recipe? Stevia is much more concentrated and doesn’t have the same bulk of the granulated sweeteners in this recipe. You would need to use a tiny amount of stevia to achieve the same amount of sweetness, so substituting stevia would completely alter the makeup of the recipe. 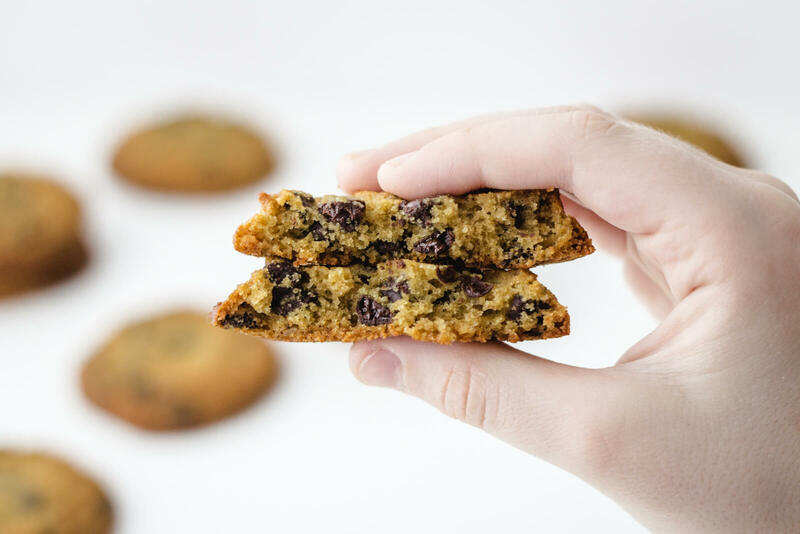 The molasses-y flavor that brown Swerve contributes to chocolate chip cookies is incredibly important to creating that classic flavor profile. Unfortunately, stevia just can’t compete in the flavor department. The allulose in this recipe does more than just sweeten the cookie dough. One of the amazing properties of allulose is that it actually helps provide a little structure and add chewiness. This is super important to achieving the great texture that these cookies have. Allulose caramelizes easily (even easier than sucrose), again creating flavors that you just can’t get from stevia. In a small bowl, combine the coconut flour, collagen peptides, cinnamon, salt, baking soda, and baking powder. In the bowl of a stand mixer fitted with a paddle attachment, cream together the butter, brown Swerve, and allulose until light and fluffy. Add the egg and then the vanilla, beating to combine after each addition. Scrape the bowl down with a rubber spatula as needed. Add the dry ingredients to the butter mixture and beat to combine. Add the chocolate chips to the cookie dough and mix on low to incorporate, or fold the chips in using your rubber spatula. Scoop the cookies out onto parchment lined sheet pans, and gently flatten the tops slightly with your palm. Bake at 325 degrees F for 12-15 minutes, rotating the pans halfway through the baking time. Allow the cookies to cool completely on the pans.